HILO » The continuing eruption just outside Hawaii Volcanoes National Park has prompted the state to close the 16,726-acre Kahaualea Natural Area Reserve, the Department of Land and Natural Resources announced. 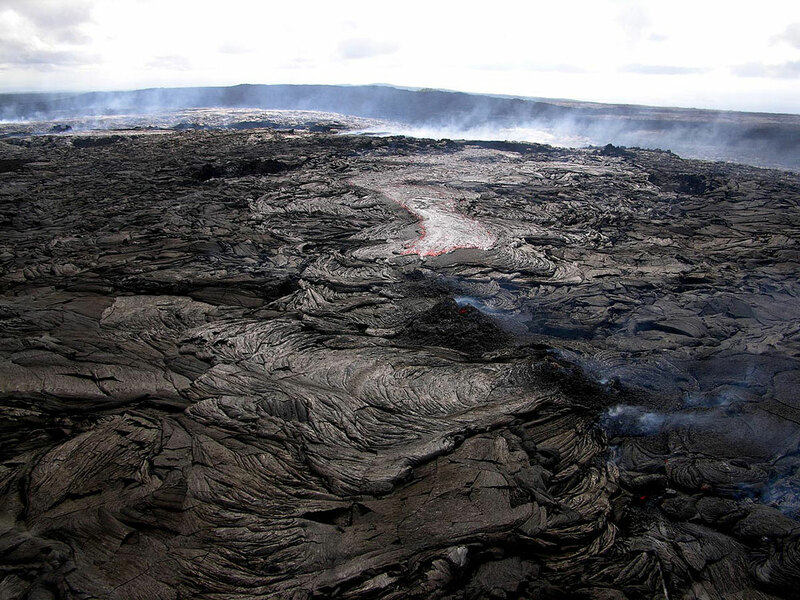 The announcement cited sudden land collapses and new lava flows, many new cracks in the ground and toxic fumes. The department previously closed the Puu Oo trail, which leads from the Fern Forest subdivision to Puu Oo crater. In 1983 to 1986 and from 1992 to the present, the eruption has been primarily at Puu Oo, just inside the eastern boundary of the park. Now it is on the state's Kahaualea land, about a mile outside the boundary. An example of the danger is several lava ponds that are perched as high as 50 feet above the surrounding land, the department said. The walls of these ponds have broken three times, releasing gushes of lava. Over the years, the county Fire Department has made numerous rescues of people using the Puu Oo trail. Some people have been injured and even killed falling into cracks along the route. Land Department enforcement personnel will be patrolling the area regularly to prevent access, the department said. The state Department of Transportation will begin overnight lane closures on the H-1 freeway airport viaduct starting Tuesday to repair potholes in the concrete surface. The Monday-through-Thursday closures will start at 8 p.m. and end at 4:30 a.m. the following morning. The department is also considering Sunday daytime closures. To minimize vibration that might disrupt proper curing of the fast-forming concrete fill, special-duty police officers will enforce a 15 mph speed limit near the repair area. Lanes directly below the repairs on Nimitz Highway might also be closed for safety reasons. Work will begin in the eastbound lanes at the Keehi Lagoon Beach Park end of the viaduct. The $9.1 million project is expected to take two years to complete. YMCA of Honolulu will host the 2007 YMCA World Camp in August to bring together teens from Africa, Asia, Europe, the Americas and the South Pacific to create a multicultural experience with Hawaii youth. Teens 14 through 19 years of age from Hawaii are invited to take part in the event at Camp H.R. Erdman on the North Shore, Aug. 10-24. The YMCA has been conducting World Camps all over the U.S. since 1985, focusing on cultural sharing, building leadership skills and increasing international awareness and fellowship, a release said. The public is invited to attend a community Cultural Festival on Aug. 18. Local schools, businesses, restaurants and musicians will join the campers for a day of live music, cultural games, international crafts and food. The extensive, diverse program will include off-camp excursions to the Polynesian Cultural Center, Waimea Bay Beach Park and Waikiki. Hawaii teens should register by contacting Josh Heimowitz, executive director of the camp, at 637-4615 or e-mailing jheimowitz@ymcahonolulu.org. Financial assistance based on need is available. For more information, visit www.ymcaworldcamp.com. Two specialists on staphylococcus will speak at a Summer Staph Institute meeting from 4 to 5:30 p.m. tomorrow at the University of Hawaii John A. Burns School of Medicine in Kakaako. They are Drs. David J. Pombo, medical director, microbiology and molecular physiology, Division of Infectious Diseases and Department of Pathology, LDS Hospital, Salt Lake City; and Matthew J. Bankowski, vice president and technical director of microbiology and diagnostic services, Diagnostic Laboratory Services. "Staphylococci: Host Response and Resistance Mechanisms" will be the topic of the free meeting in Room 301, Medical Education Building. Police arrested a 39-year-old man in Kahala on Tuesday night for allegedly striking a security guard. At about 8:30 p.m. a security officer at a shopping complex responded to a report of a disorderly drunken man at one of the restaurants. The man was ordered to leave the area, and he allegedly assaulted the security officer. Police were called and arrested the suspect on suspicion of second-degree assault. Police arrested a 28-year-old man who allegedly slashed and assaulted a homeless man in Pearl City. At 8:04 p.m. Tuesday the suspect and another man were in a Pearl City park, when they were approached by a 28-year-old homeless man who complained about the two urinating in the park. The suspect and the other man hit the victim, who later fought back, police said. The suspect allegedly slashed at the victim with a knife, causing minor cuts. The homeless man later identified the suspect, who was arrested on suspicion of second-degree assault. Police arrested a 25-year-old man Tuesday night for allegedly threatening his neighbor while drunk. A 30-year-old Mililani man tried to intervene in an argument between his sister and a drunken neighbor, police said. The suspect allegedly picked up metal gardening shears and made several threats to kill the man, police said. Police were called and arrested the man on suspicion of first-degree terroristic threatening. Big Island police are asking for the public's help in finding 48-year-old Deric Don Kalaikauiki Faris. Faris is wanted for three outstanding warrants and incidents of theft and burglaries in the Kau district on the Big Island. He is described as 6 feet 2 inches tall, 200 pounds, with a medium build. He has short, partially gray hair, green eyes and no facial hair. Police said Faris was last seen in the Hawaiian Ocean View Estates area but might have gone to be with relatives in the Hilo or Puna area. Anyone with information is asked to call officer Dane Shibuya at 939-2520 or police at 935-3311. Callers can also call CrimeStoppers at 961-8300 in Hilo or 329-8181 in Kona. Big Island police are looking for Matthew Kealoha Akina, 18, who is wanted for a $25,000 bench warrant. Anyone with information on Akina's whereabouts is asked to call police at 935-3311 or CrimeStoppers at 961-8300 in Hilo or 329-8181 in Kona.